Sustainable energy sources play a crucial role in reducing CO2 emissions and securing future energy supplies. Given our strategic focus on climate change, we are keen to support energy generation from renewable sources. But as sustainable energy projects increase in scale and complexity, so do the risks associated with them. However, innovative risk transfer solutions can help reduce these risks and drive investment in the sector. Offshore wind is considered one of the most promising renewable energy sources. But like renewable energy in general, it presents very complex risks. Unlike traditional lines, there is no long loss history to refer to. Underwriting such risks is therefore challenging from an insurance perspective. Swiss Re Corporate Solutions takes a special interest in offshore wind as it has both the large capacity and the technical expertise to help manage the associated risks. We are continually enhancing our understanding of these risks and share our insights with our clients as well as other insurers. As a result, we are now considered a “lead market” for offshore wind risks. In the last five years, Swiss Re Corporate Solutions has participated in numerous offshore wind projects, including wind farms, standalone offshore substations and standalone export cables. Offshore wind farm technology keeps evolving. Swiss Re Corporate Solutions is continuously enhancing its understanding of the associated risks and, in 2017, agreed to provide insurance protection to a Danish pilot project set up to test more cost-effective foundations and other innovations. 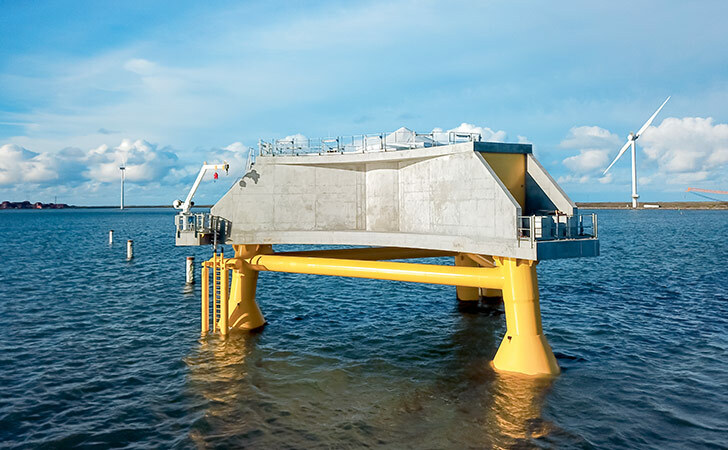 This is a innovative 28 MW project in northwestern Denmark, close to the harbour of Thyborøn. It was set up by the Danish Energy Agency (www.ens.dk) as a pilot project to test new offshore technologies and integrated design. Its two developers are Nissum Bredning Vindmøllelaug (www.nbvind.dk) and Jysk Energi (www.jyskenergi.dk), who had placed the winning bid following the Danish Energy Agency’s tender. A key innovation tested by the project is a new “gravity jacket foundation” concept developed by Siemens. Foundations generally account for 20–30% of an offshore wind project’s construction costs, and this new technology allows to reduce these. The project also features a new cable and turbine concept with a higher voltage of 66kV, which will result in lower costs for cabling and reduced transmission losses. The DEA expects that, together, the innovations to be tested at Nissum Bredning will bring significant savings regarding both construction and operating costs, and have a positive impact on the levelised cost of electricity (LCoE). Swiss Re Corporate Solutions also supports phase 2 of Trianel Windpark Borkum II, the first purely communal wind farm in the North Sea (www.trianel-borkum.de/en/twb-ii/). It is located around 45 kilometres north of the German island of Borkum. With a planned capacity of 203 MW generated by 32 turbines, it is expected to power more than 140 000 homes and save 290 000 tonnes of CO2 per year. The owners include 17 German municipalities as well as the electric utility of the City of Zurich (www.ewz.ch). Construction of the windpark was decided in 2017 and is expected be completed in 2019.